The stars of these earrings are two stunning black tensha beads, dangling on short lengths of black chain. 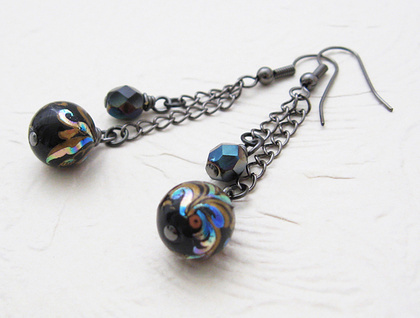 They are accompanied by two jet black, Czech glass beads with a finish called 'celsian' – a scorched-looking iridescence. The word 'tensha' in Japanese translates to the English word 'transfer'. Tensha beads are made by applying a very detailed decal to a base coloured acrylic bead. The transfer is then sealed with an acrylic coating, which protects the image from abrasion. Foil accents are often used to enhance the decoration. Every single bead is made by hand, which makes them expensive but highly desirable. These tensha beads have swirling designs in bronze or dark gold, accented by coloured foil in pink, green, peacock blue, teal, and mauve. Czech glass is famous worldwide for its high quality. These two faceted, Czech glass beads have been firepolished: a technique whereby the beads are 'polished' by subjecting them to a very hot flame, creating a bright, shiny surface. Firepolished glass sparkles almost like crystal. 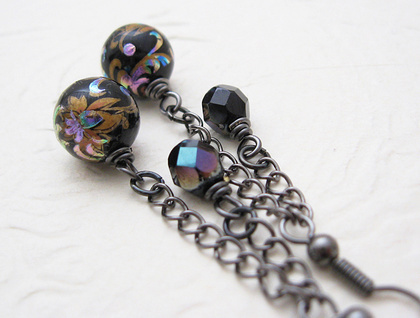 The celsian finish on these particular firepolished beads gives a metallic, burnt look, like rainbow scorch-marks on metal. This subtle effect echoes the colours in the tensha beads, so that the firepolished glass complements the tensha beads perfectly. 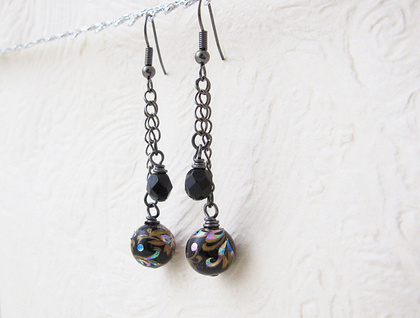 All four beads are wire-wrapped, and dangle on short lengths of black chain. The 'Black Tensha' earrings are a one-off design, never to be repeated. The black ear-hooks are made of surgical steel, which is hypoallergenic, so most sensitive ears should be fine wearing these earrings. The curb-style chain has a brass base, is nickel free, and is gunmetal black in colour. The earrings have plenty of swingy movement, but not so much that they jitter all over the place and look undignified. They come with little plastic stoppers that can be slid onto the hooks to prevent them from working their way out of the wearer's ears. The earrings measure 58mm from top to bottom, including the hooks. 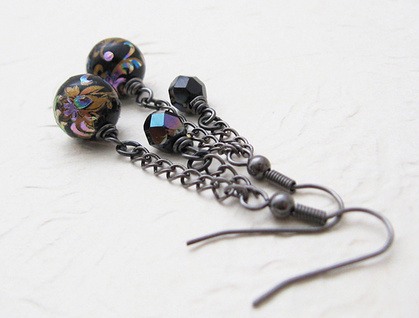 From the bottom of the ear hooks to the bottom of the tensha beads measures 41mm, while the drop from the ear hooks to the bottom of the Czech glass is 25mm. The tensha beads themselves are just 10mm across.